Apple today announced it is working on a new version of its iWork productivity suite for iOS during its "Let's Take a Field Trip" event at Chicago's Lane Technical High School, where it also introduced a refreshed low-cost 9.7-inch iPad with Apple Pencil support. Integrated Apple Pencil support in the new upcoming versions of Pages and Keynote will enable users to add drawings directly to reports and take advantage of smart annotation features, while students in particular will benefit from using the input device in Numbers to add to their "lab reports", said Apple. Teachers on the other hand will be able to mark up students' Pages reports directly using an iPad and Apple Pencil, thanks to the suite's enhanced markup functions. When users annotate, for example, the markup anchors to the word or image. So as edits are made, the pencil annotations move. "iWork is a powerful suite of apps designed for iPhone, iPad and Mac that is used in classrooms around the world," said Susan Prescott, Apple's vice president of Apps Product Marketing. 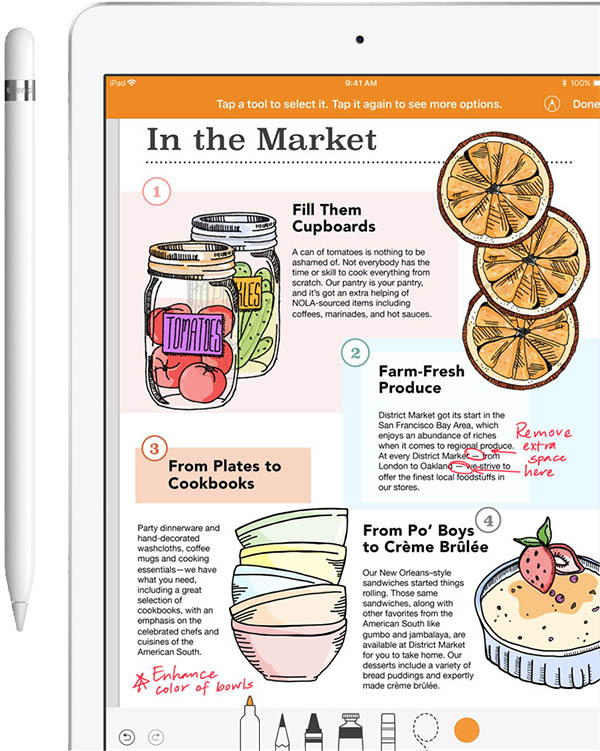 "With Apple Pencil support on iPad, the new Pages, Numbers and Keynote apps now let students bring a whole new level of creativity to their documents, spreadsheets and presentations, while the innovative new Smart Annotation feature gives students the ability to give, receive and incorporate feedback easier than ever before. Students can also use the built-in, real-time collaboration tools available in iWork to explore and learn together." Apple also announced that it is building digital book creation into the new version of Pages, which will come pre-installed on the new $329 9.7-inch iPad. Books generated within Pages can include photos, videos, Apple Pencil illustrations, and more. Pages, Numbers, and Keynote on iOS and Mac are free and come preloaded onto most devices, including the new 9.7-inch iPad. Today's updates will be available to download "soon" on the App Store and Mac App Store. So yet another feature thats "coming soon"... so like next year maybe. Apple's neglect of their software is astounding. iWork could have been so much more/better. It's really a shame Apple doesn't really update most of it's Apps. I’m looking at pages in the app store that says updated 3 hours ago but my ipad pro doesn’t show that I can get the update.